We asked a fitness expert burning questions about metabolism and weight loss. Carlena Henderson describes herself as an “avid fitness enthusiast”—and for good reason. She’s been a personal trainer for more than five years, and competed in multiple bodybuilding contests. It was competing that further sparked her interest in the body’s metabolism. 24Life asked Henderson—who specializes in weight loss, weight lifting and rebuilding metabolism—a few questions about the myths surrounding the metabolism, and how to build and maintain a healthy metabolism for losing weight. 24Life: Fact or fiction: Your metabolism naturally slows down as you age? Carlena Henderson: Fact. As we age our bodies become less efficient, and muscle mass decreases. This loss of muscle mass slows down our metabolism. 24Life: Fact or fiction: Some people are born with slower metabolism? CH: Fact. Just as some people are tall, short, dark, light, some people have fast metabolism while others have a slow one. There are three different body types: endomorphic, mesomorphic and ectomorphic. People who are ectomorphic typically have much faster metabolisms than those who are mesomorphic or endomorphic. 24Life: Fact or fiction: Too much exercise can ruin your metabolism? CH: It’s not [necessarily] too much exercise, it’s whether or not you are providing your body with the fuel that it needs. One of the worst things you can do for your metabolism is to not eat enough food. We’re always trying to work out more and eat less, but there is a limit to how few calories we can eat. Our metabolism is designed to protect us. If we ate less calories than what our body needed every day, in theory, we would dwindle down to nothing. To protect us, our body has a built-in safety system called metabolism. This safety system slows and becomes less efficient in providing our body with fuel to draw from. If you find that you are eating very little food, exercising multiple times a week and cannot lose or even start to gain weight, your metabolism is likely the reason. CH: Your goal is never to eat as few calories as possible. Your goal is to eat as many calories as you can without gaining weight. When you do this, it means that your metabolism is working at an optimal level. It seems counterintuitive to say, “Eat more food,” but if you do you’ll be amazed at the short-term benefits—more energy, more clarity, better sleep—and the long-term benefits, including the ability to lose weight and keep it off because you’re losing it the right way. 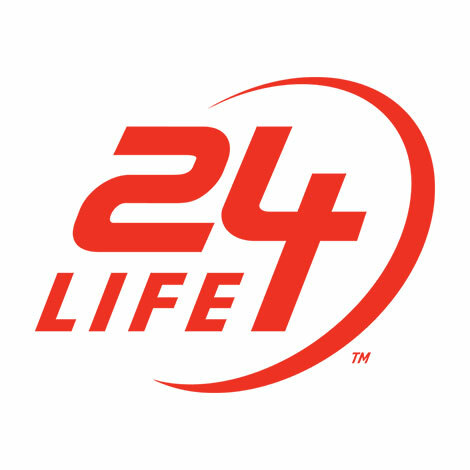 24Life: Why is it (oftentimes) more difficult for women to lose weight? CH: Women in general need more essential fat than men, 10 to13 percent versus two to five percent, respectively. This means that women already start at a disadvantage because our bodies require more fat to function. This, coupled with fluctuating hormones makes weight loss more challenging for women. Furthermore, there is a big assumption made when reading about dieting: that your metabolism is working at its optimum level. Most people, particularly females, have a sluggish metabolism. We think that we need to eat less and work out more, and it’s usually the opposite. In this picture to the right, I look lean. The same morning I was nervous and thought I had not lost enough weight. It was not until I pulled my water that I finally got the look that I was going for, but that look is not maintainable. We have very unrealistic expectations of how the female body is supposed to look. We don’t understand that female physiques will be softer and there will be cellulite. We should be kinder to ourselves. I always found that I got the leanest during prep when I ate the most during my off season. 24Life: What are the best and worst foods for your metabolism? CH: Stay away from sugary and or processed foods, opting instead for nutrient-dense foods. If I had to choose between an apple or a candy bar, I’d choose the apple. Eat whole foods that come from the ground. Also, make sure you’re getting enough protein. I like to get my protein from as natural a source as possible. I’d rather have my protein from meat than from a powder, shake or a protein-enriched cookie. Stay away from junk food. 24Life: What is the first thing that someone should do when he or she wakes up, to kick-start their metabolism? 24Life: What type of movements should we be doing to ramp up metabolism? CH: Lift more weights. Weightlifting is anabolic, meaning it builds muscle. Increasing lean muscle will increase your metabolism. 24Life: What is a metabolism-boosting workout that you would recommend? CH: Anything that is weight-bearing, but particularly workouts with compound moves or ones that use big muscle groups: legs, back or chest. After a leg workout, you should feel hungry. This is because most leg exercises are compound moves, or moves that use more than one muscle. This means that you are burning more calories in a shorter amount of time. 24Life: Should I eat protein right after a workout? CH: For the elite athlete or the person prepping for a bodybuilding show, protein pre- and post-workout is important. The reality however, for the average gym-goer, is that as long as you’re eating something healthy post-workout, you’ll be fine. Please note that the viewpoints expressed are Henderson’s own and do not necessarily reflect the viewpoints of 24 Hour Fitness. Always consult your health care provider before undertaking changes in your diet or fitness regimen.